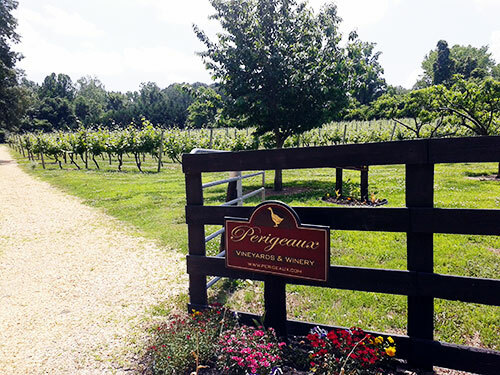 Perigeaux has four vineyards of eight acres on a former tobacco farm located at the southern end of beautiful Calvert County, Maryland. Situated on the east bank of the Patuxent River, near the mouth of historic St. Leonard Creek, our vineyards of sandy Westphalia soils have produced premium Cabernet Franc, Cabernet Sauvignon, Merlot, Zinfandel, Montepulciano, Sangiovese, Chardonnay, and Pinot Gris since 2005. With over 4800 vinifera vines, the four estate vineyards produce all of the grapes crushed and fermented onsite for both the Perigeaux and Mackall Road wines. Each successive harvest further develops vines with the unique character of the Southern Maryland micro-climate between the Chesapeake Bay and Patuxent River. All of our wines reflect the Perigeaux focus on the highest quality viticulture and sustainable practices in the vineyard. Guests may walk through the vines during their visit and see the grapes as they mature through the growing season. We invite you to visit our beautiful vineyards! Tours of the vineyards and winery are offered at 1 pm and 3 pm on weekends and by appointment during the week. Use the left and right arrows in the images below to scroll through photos of our beautiful Southern Maryland Perigeaux Vineyards.